Mit einer Pressemitteilung hat Samsung seinen neuen Prozessor für mobile Geräte wie Tablets und Smartphones vorgestellt. Der Orion ARM Cortex A9 ist dein DualCore Prozessor und soll seinen Vorgänger Hummingbird bzgl. 3D um die fünffache Leistung in den Schatten stellen. Der neue Samsung Prozessor soll auch 1080p Inhalte mit 30FPS wiedergeben können. Zudem wird jetzt HDMI 1.3a unterstützt und sogar die Ausgabe über drei Displays gleichzeitig. Die Serienproduktion soll in der ersten Hälfte des nächsten Jahres schon beginnen. Dadurch gehe ich fest davon aus, das es dann auch einen Samsung Galaxy S Nachfolger mit dem neuen Prozessor geben wird. Wie René von mobiFlip, stelle auch ich mir die Frage wie sich dann die Akkulaufzeit bei solch einem Prozessor verhält. Die komplette Pressemitteilung findet ihr weiter unten. 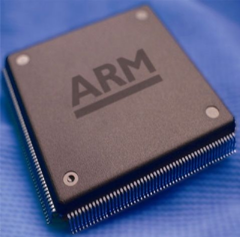 TAIPEI, Taiwan–(BUSINESS WIRE)–Samsung Electronics Co., Ltd., a world leader in advanced semiconductor solutions, today introduced its new 1GHz ARM® CORTEXTM A9-based dual-core application processor, codenamed Orion, for advanced mobile applications. Device OEM developers now have a powerful dual processor chip platform designed specifically to meet the needs of high-performance, low-power mobile applications including tablets, netbooks and smartphones. Samsung’s new processor will be demonstrated at the seventh annual Samsung Mobile Solutions Forum held here in Taiwan at the Westin Taipei Hotel. Designed using Samsung’s 45 nanometer low-power process technology, Orion features a pair of 1GHz ARM Cortex A9 cores, each comes with a 32KB data cache and a 32KB instruction cache. Samsung also included a 1MB L2 cache to optimize CPU processing performance and provide fast context switching in a multi-tasking environment. In addition, the memory interface and bus architecture of Orion supports data intensive multimedia applications including full HD video playback and high speed 3D action games. Samsung’s new application processor incorporates a rich portfolio of advanced multimedia features implemented by hardware accelerators, such as video encoder/decoder that supports 30fps video playback and recording at 1080P full HD resolution. Using an enhanced graphics processing unit (GPU), the new processors are capable of delivering 5 times the 3D graphics performance over the previous processor generation from Samsung. For design flexibility and system BOM cost reduction, Orion integrates a set of interfaces commonly used in mobile devices to configure various peripheral functionalities. For example, with this processor, customers have the choice to use different types of storage including NAND flash, moviNANDTM, SSD or HDD providing both SATA, and eMMC interfaces. Customers can also choose their appropriate memory options including low power LPDDR2 or DDR3, which is commonly used for high performance. In addition, a global positioning system (GPS) receiver baseband processor is embedded in the processor to seamlessly support location based services (LBS), which is critical in many emerging mobile applications. Orion features an onboard native triple display controller architecture that compliments multi-tasking operations in a multiple display environment. A mobile device using the Orion processor can simultaneously support two on-device display screens, while driving a third external display such as a TV or a monitor, via an on-chip HDMI 1.3a interface. Orion is designed to support package-on-package (POP) with memory stacking to reduce the footprint. A derivative of Orion, which is housed in a standalone package with a 0.8mm ball pitch, is also available. Samsung’s new dual-core application processor, Orion, will be available to select customers in the fourth quarter of 2010 and is scheduled for mass production in the first half of 2011.